In today’s show we answer a couple of questions that have been posed over the last two weeks by listeners across the world. David, loving the show and your energy. 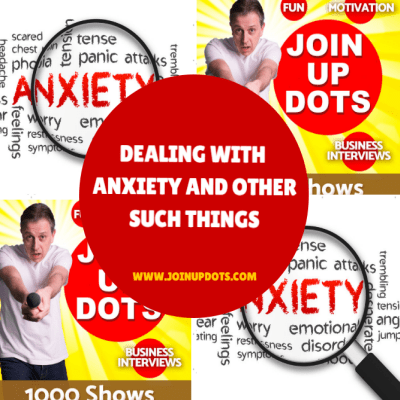 I would love to know do you ever worry about anything at all, as you dont seem to show any sign of anxiety even though it cant be easy running Join Up Dots on your own as you revealed in episode 876. And now we answer our second question which has been posed by a gentleman in the UK who is wondering how to get past that stage in business building when you get bored and think its not worth pursuing with. I have been working through your back episodes and now have listened to every single show. I cant believe that I now have to wait for your next episode to be released. I have been thinking of starting a business but no matter what I start working on, after awhile it seems like a waste of time and I stop and start something else. Im sure, as I have hear you say on many shows, that sometimes you feel that you were going in the wrong direction so how did you refocus your energies and create the amazing Join Up Dots? Ps second question have you ever thought of creating a YouTube channel?